Popular rotary trimmer ideal for cutting drawings, photographs, posters etc. Available in a range of different cutting widths. Rotary blade set in hardened Steel. 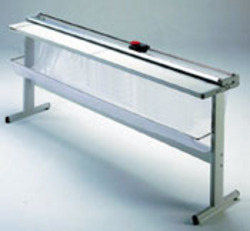 Sheet holder made of transparent plastic. Available with or without stand. Stand includes retrieval tray for trimmings.